In 2017 ESP Developments were appointed to complete the full fit-out and set-up of a new gourmet grocery store and coffee shop on Hastings Street in Noosa. Hastings Street is home to the best in boutiques, international standard resort hotels and high-end restaurants, and is a hub of activity in central Noosa. This new grocery store, Providore on Hastings, supports and showcases local producers and food brands, from boutique chai blends, to cheeses found nationally. If it is made, created or grown on the Sunshine Coast Providore try and stock it to share with their customers. The fit-out of the store, the style, layout, ambience and lighting was therefore crucial in creating the perfect location for this venture. 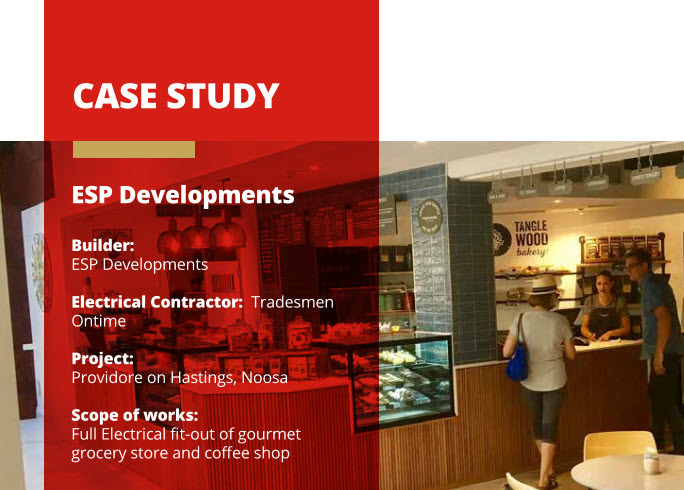 Tradesmen Ontime were contracted by ESP Developments as the electrical contractor on the Providore project. ESP Developments explained that they use Tradesmen Ontime in more than 90% of their projects and they are always happy with the quality of their workmanship. This particular project however, stands out as being one of the more challenging, simply due to the nature of the location and the tight timelines required.